COFFS COAST (NSW) – It’s been dubbed the “Corker in Coffs” and with a wave of the Australian flag the Ceremonial Start to Kennards Hire Rally Australia today launched the thrilling showdown to decide the next FIA World Rally Champion. The eyes of rally fans around the world will be on the Coffs Coast as top contenders Sébastien Ogier, Thierry Neuville and Ott Tänak line up at 8am tomorrow for the first of 24 stages and 318 kilometres of fast and furious competition on the final round of the 2018 WRC season. More than 1000 rally fans turned out at Coffs Harbour’s Jetty Foreshores for the Ceremonial Start, greeting the full field of entrants in the WRC, CAMS Australian Rally Championship and R6 Digital Cup and Classic Cup support competitions. The WRC is tightly poised with just three points separating five-time champion Ogier, in an M-Sport Ford Fiesta, and Hyundai star Thierry Neuville. Toyota’s Ott Tänak is a further 21 points behind but still with a chance of a maiden title if his rivals fail. Ogier struck the first tactical blow this morning when he won unofficial honours in a shakedown test on NSW Forests roads just north of the Coffs Harbour event base. 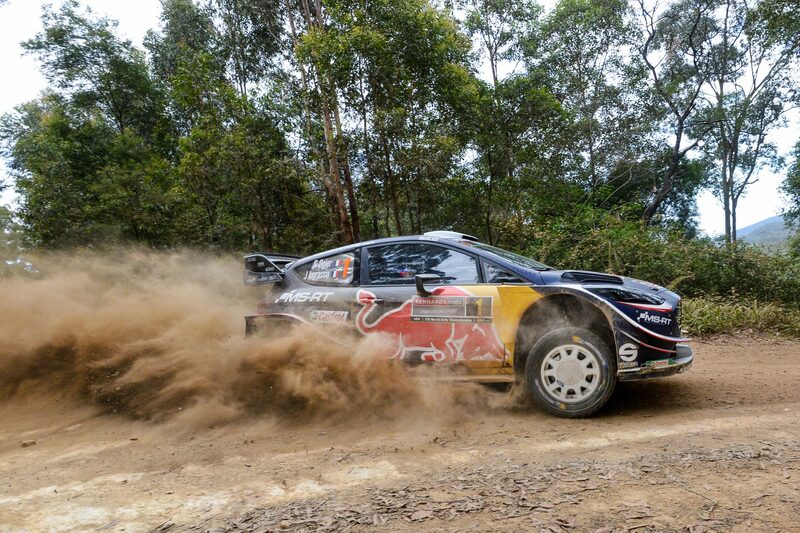 Ogier set the benchmark through the Wedding Bells run with a 2min53.8sec best. He led Hyundai’s Andreas Mikkelsen (2:54.0s) and Tänak (2:54.0), with Neuville fourth (2:54.1s). Ogier has almost confirmed his dominance by looking relaxed all week at various appearances, as if the nail-biting season climax isn’t happening. But he admitted he’s aware of the historical importance of this Rally Australia. “For me it’s the first time I’ve had to fight for the title on the last event,” he said. Neuville said he was feeling excited, but added this might change as the start approaches. “Perhaps the nerves will set in tomorrow morning when we head to the first stage,” the Belgian said. Tänak is the outsider of the trio to win the drivers’ championship, but knows what’s needed if he’s to cause a surprise. “There is still the target to win the rally and the Power Stage and see what happens after that,” he said. With unprecedented interest in the title showdown, the global television audience for Kennards Hire Rally Australia could exceed 60 million viewers, says event Chairman Ben Rainsford. The rally will be broadcast live on Saturday and Sunday to more than 150 television markets, while millions more fans will follow every stage on the new WRC+ All Live internet streaming service. In Australia, the weekend action will be broadcast on 7mate and Fox Sports Australia. Rainsford said he expected big crowds of spectators for the seventh Rally Australia hosted on the Coffs Coast.